Why do I paint my nails before I blog? It is so hard to type right now. I'm wearing two wet coats of a gorgeous purple that I want to photograph in the morning, and then I'm going to layer over it :) Meanwhile I'm doing my best not to hit the keys with my nails. 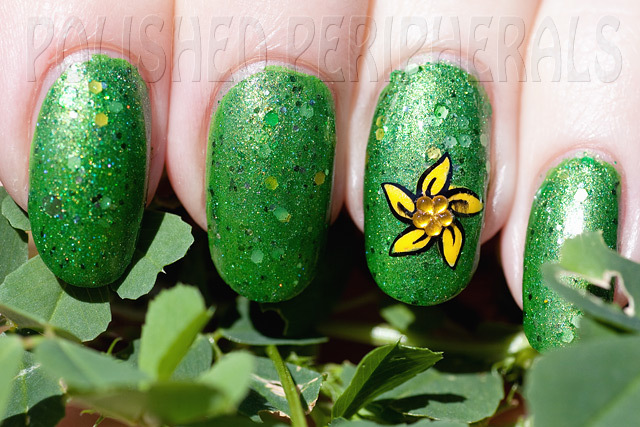 Here's a manicure I did for Daffodil Day. Yeh I know it was a few months ago but I haven't blogged it yet. 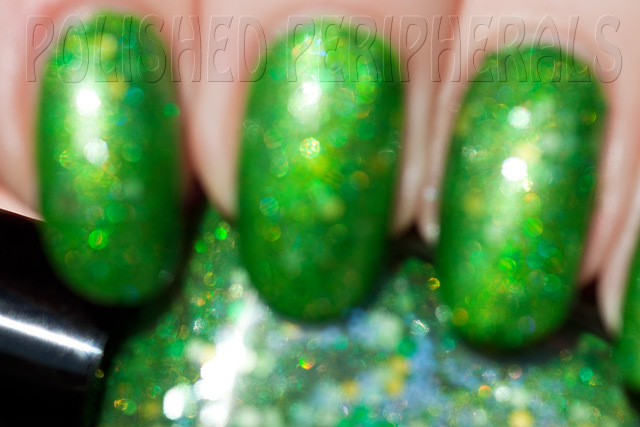 I wanted a bright grassy spring green so I made one from a heap of different glitters and pigments. 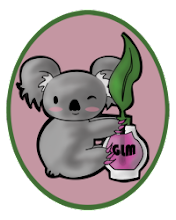 I kept playing with ingredients until I came up with something that would give me full coverage in two coats and be reasonably smooth. I call this one Greener on the Other Side. 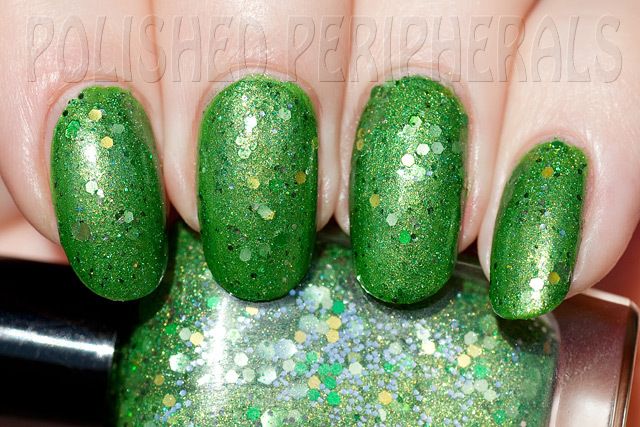 It's hard to see in the photos but there's really fine green and gold holo glitter in there as well as the small dark green glitter and larger gold hexes with two different shades of green hexes. It sparkles so much in the sun. Here's a blurry shot that shows the sparkle. It's a lovely green in the shade too. I finished with a thin coat of Orly Polishield. Then I stamped a flower to make my daffodil but because I wanted it in colour with a black outline I worked in reverse. I stamped with Ulta3 Black Satin onto a plastic lunch bag first. Then I filled in the yellow with Ulta3 Honolulu. I finished with a layer of Ulta3 Lily White to make the yellow 'pop'. Then I trimmed around my flower leaving a plastic edge and painted my nail with a thin coat of top coat. When the top coat was tacky dry I pressed the piece of plastic, stamp side down, onto the top coat then peeled away the plastic leaving the flower. It worked surprisingly well considering I'd never tried it before. Then I added a flower nail gem and finished with a coat of Seche Vite (which smudged the black). I am going to bookmark this. I will have to try that stamping technique. That stamping technique sounds great, I'll have to give it a try!